related health make a difference? Together with the research and action network FoHRC (Food, Human Rights and Corporations), we gathered leading experts in the fields of human rights and nutrition at the Norwegian Centre for Human Rights on Monday 24 April 2017. Our concern at the seminar was with the impact that marketing of food products high in fat, salt or sugar (HFSS), directed to children, may have on their food choices and consumption. It is well documented that a high intake of HFSS foods contribute to the global childhood obesity epidemic and associated non-communicable diseases (NCDs), such as heart diseases, cancer, and diabetes 2. Aggressive marketing of such products is part of the problem. These issues need to be discussed and acted upon from a human rights perspective, which means not only to request relevant businesses to respect human rights, but also to define protective obligations by states. Under international human rights law, states have an obligation to respect, protect and fulfil the right to health, the right to food, and children’s rights. The focus of this particular seminar was on the states’ protective measures, and touched upon the ongoing work in the UN to develop a General Comment on State Obligations under the International Covenant on Economic, Social and Cultural Rights in the Context of Business Activities. The comment will provide an authoritative interpretation of what these state obligations entail, and help states to ensure that legislation and policies are in place to protect people whose rights are negatively affected by business activities. FIAN International has submitted an input to the process, calling for an inclusion of the Binding Treaty on Transnational Corporations and other Business Enterprises with respect to Human Rights. Our key-note speaker for the day was Dr. Francesco Branca, the Director of the Department of Nutrition for Health and Development at the World Health Organization (WHO). He held an inspiring talk under the title Protecting human rights and preventing conflicts of interest are essential to improve nutrition. Other speakers included Kaja Lund-Iversen from the Norwegian Consumer Council, Asbjørn Eide from the Norwegian Centre for Human Rights, and Ann Louise Lie from the Centre for Development and the Environment at the University of Oslo. Liv Elin Torheim from the National Nutrition Council moderated the discussion, while Wenche Barth Eide, Coordinator of FoHRC, opened and concluded the session. 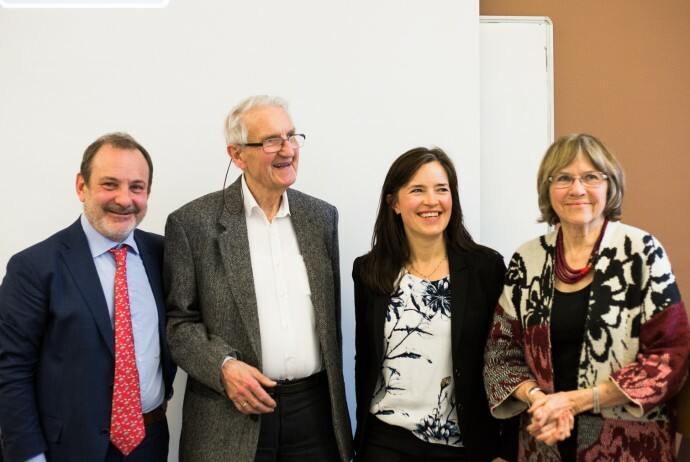 Photo: From the left: Dr. Francesco Branca, Asbjørn Eide, Liv Elin Torheim, and Wenche Barth Eide. Photograper: Beate Østengen.